By trying to pull apart the band, this exercise targets the chest, triceps and upper back. To get started, stand up with your feet shoulder-width apart. Hold the resistance band in front of you and grip it at both ends. Next, pull the band apart as if you were trying to rip it in half with your bare hands. CanDo® bands are very resilient, so do not be afraid of ripping them. Once you spread your arms as much as you can, slowly return to the starting position. Repeat this exercise 8 to 10 times or until you feel fatigued. By standing on the band and pulling up, this exercise will target the biceps. To get started, stand up with your feet shoulder-width apart with the middle of the band underneath your feet. Next, grip both ends of the band with the inside of your forceps facing outwards. Tuck your elbows in and curl the band with your biceps. Slowly return to the starting position and then repeat this exercise 8 to 10 times. 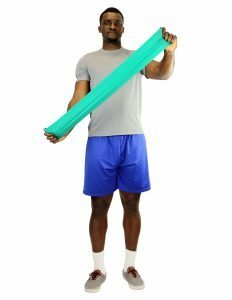 This exercise turns a well-known exercise into something more challenging by adding the resistance band. It targets the hips, glutes, quadriceps and hamstrings. Using the CanDo® Loop Band, place your feet inside the band. 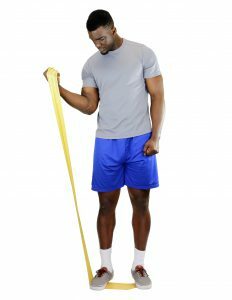 Stand up with your feet shoulder-width apart and make sure the loop band is around your ankles. Then do a normal squat with your knees bent and your glutes sticking out. Return to the starting position and then repeat this exercise 8 to 10 times. For more exercises with the bands, click here. To check out our CanDo® pre-cut resistance bands, click here. To check out our CanDo® Loop Bands, click here.